Earn Money in a brand new trade – Cleaning Computers!! New business, almost non-existent, promises a new career: for both men and women. This is an emerging industry, whose potential is virtually untapped: Computer Cleaning for banks, auto dealers, offices, retail stores, factories, schools, hospitals, medical facilities and this is just scratching the surface… the list goes on. 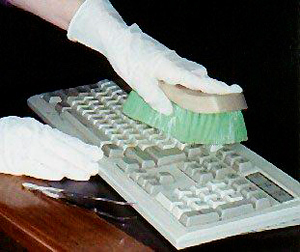 We’re talking about cleaning computers, monitors, keyboards, fax machines, telephones, cell phones, photocopiers, printers, adding machines, multifunction machines, cash registers, bank machines, credit card swipe machines, diagnostic equipment, postage meters, and so much more. There is a great demand for this little known business. Few people in the marketplace offer such a service. Check out your local telephone directory, Better Business Bureau or Chamber of Commerce. …2711 janitorial services in the state of New Jersey alone. We called over 600 of them and couldn’t find one who cleaned computers and electronic equipment. Here in Calgary, Alberta, Canada this service has been performed for companies since the 1990’s. Amazingly, there are very few companies who offer this service. We have an offer for you. We’re going to sell you our secret. We’ve actually decided to provide this opportunity to you to help you do what we’re doing – for a small price. You can start your own business at home. There is virtually no overhead because you do the cleaning on-site – at the clients’ locations. We need some good people to get started. Men, Women… this is a simple business almost anyone can do. Small start-up costs: no office to maintain, no inventory to purchase, no high cost equipment to finance. We want to help you get started. Find out how YOU can start your own extension of this lucrative, simple business.